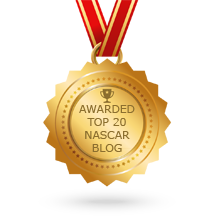 Kevin Harvick dominated the Gander Outdoors 400 at Dover International Speedway, but it was Chase Elliott that claimed the victory on the “Monster Mile” and advanced in NASCAR‘s Playoffs. Kevin dominated the race at Dover earlier this year winning both stages and the race back in May. He appeared to be poised to make a repeat performance and sweep the races at the track for the 2018 season. Kevin again won stage one and stage two of the race while leading 290 laps of the scheduled 400 laps at Dover. However, Kevin’s hopes of getting the win this time at Dover went out the window when a mistake was made on pit road. On lap 322 while getting service to his car a valve stem was knocked off a tire. That forced Kevin to come back to pit road for new tires and putting back in the field after being out front nearly the entire race. This opened the door for other drivers to race for the win on the “Monster Mile.” There was a total of eight drivers that exchanged the lead 15 times during the race. However, the most important came near the end of the race when Chase Elliott, who was near the front all afternoon, was able to get to the lead. Lap 397 saw the race’s fifth and final caution period take place for a multi-car accident on a restart following the fourth yellow flag period. That would put the race in the NASCAR Overtime of a green-white-checkered finish. Chase Elliot led the field to the green flag and fought hard to edge out Denny Hamlin for the lead. Chase then held that lead for the final lap of the race to claim his first career Monster Energy NASCAR Cup Series win on the “Monster Mile.” The win is his second career win in NASCAR’s top division which both came this season. Denny Hamlin was able to hold on for a second place finish with Joey Logano claiming third place. Erik Jones scored a fourth place finish with Kurt Busch rounding out the top five. Kevin Harvick was able to race back through the field to finish in sixth place. See the complete race results for the Gander Outdoors 400 here. 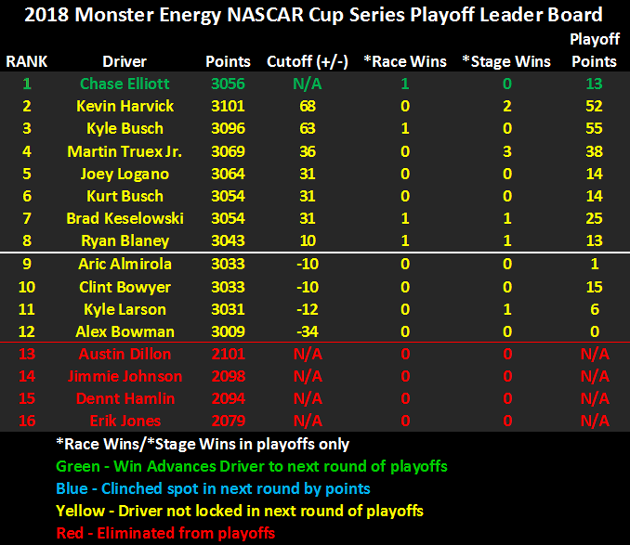 The win vaults Chase Elliott to the top of the NASCAR Playoffs Leader Board with automatic advance to the next round of the post-season. The rest of the contending drivers have two more races to secure their spot in the next round by either winning or accumulating enough points to advance. The pressure will be on this week for the 11 remaining playoff drivers that are hoping to advance as they head to Talladega Superspeedway. This is a race that most call a “Wild Card” in the 10-race NASCAR post-season. That’s because anything can happen and usually does at Talladega. Any of the drivers can find themselves in position to win the race at the end. However, any driver can also be taken out the race by their own mistake or somebody else’s. Every driver will be doing their best to not be part of the “Big One” when it happens … and it almost always will. We will find out what does happen this Sunday afternoon, October 14th in the 1000Bulbs.com 500 at Talladega Superspeedway.